Mats Hummels has hailed Robert Lewandowski's performance against Wolfsburg after the striker scored twice and set up the other to help Bayern Munich end their winless streak. 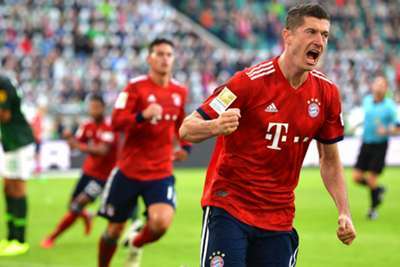 Bayern halted a run of four straight games without a victory in all competitions to relieve some of the mounting pressure on Niko Kovac, Lewandowski grabbing a double before turning provider for James Rodriguez to wrap up a 3-1 victory. Lewandowski ended his own barren scoring run in the Bundesliga stretching back to September 22, but Hummels insists that the Poland international has been playing at the top of his game throughout the campaign. "He was absolutely outstanding," Hummels told the official Bundesliga website. "[He was] A team player and he played smart. But he's been doing a good job all season. "For me personally, nothing ever changes. When I go out onto the pitch, I always want to win. "All the other circumstances, whether we're favourites or underdogs, whether we're under pressure or not, doesn't make a big difference." Bayern's win also ended a poor streak of results for Hummels, who was involved in Germany's Nations League defeats to Netherlands and France during the international break. "It's definitely liberating, when you haven't won six games in a row, you really appreciate it," the centre-back added. "We played a really good game. It may not have been perfect but we had everything under control."